I am a professor in the Department of Electrical & Computer Engineering at the University of Denver and the director of the computer vision and social robotics laboratory. I received my PhD degree from University of Miami, FL in 2007. My research lies in visual pattern recognition, social robot design, and bioengineering. I enjoy teaching as much as I enjoy doing research! I teach machine learning, computer vision, and digital systems design at undergraduate and graduate levels. I also outreach to the community with goals of promoting public awareness of innovative technology (e.g. social robotics) for well-being and health care. Dr. Mahoor’s interview with 9News on using Socially Assistive Robotics for Alzhimer’s disease and depression therapy: 9News ; on YouTube. I serve as an Associate Editor of the IEEE Transactions on Cybernetics. Our paper on describing AffectNet database accepted for publication in IEEE Transactions on Affective Computing. download link. I will serve as an Area Chair for WACV 2018. I will serve as an Area Chair and a Demo Chair for FG 2018. I serve as the Local Arrangement Chair for IJCB 2017 that will be held in Denver. I served as an Associate Editor for ICRA 2017. I serve as an Area Chair for WACV 2017. 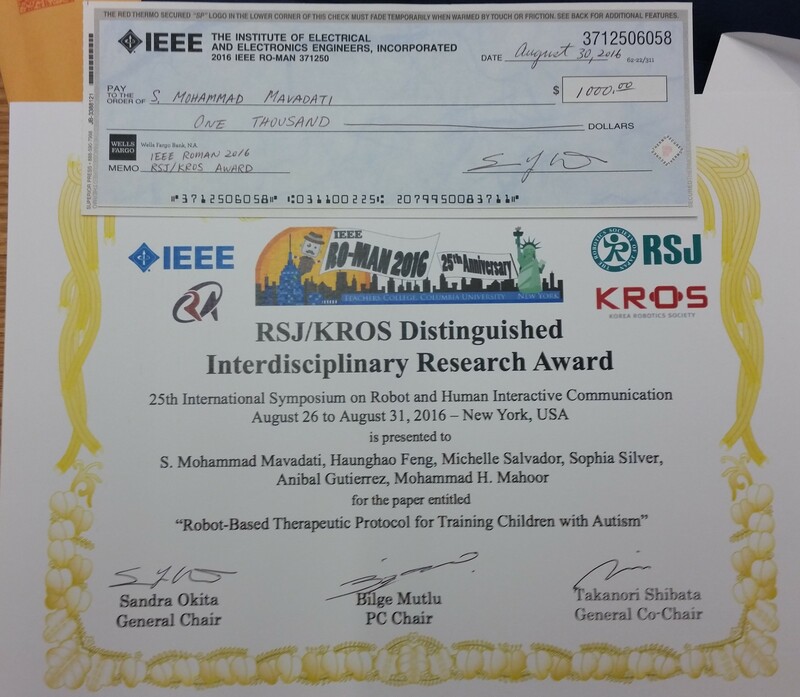 Our paper received the RSJ/KROS Distinguished Interdisciplinary Research Award in the RO-MAN’16 conference. Robot Assist webpage is online now. A video of our lifelike robotic face can be seen here. You can listen to my interview with Colorado Public Radio here. Dr. Mahoor has been elected as a Senior Member of IEEE since June 2013. The DISFA (+) Database is now released. Check out the University of Denver’s RoboCup Team.